I’m not what you would call a naturally flexible person. In fact, my husband has been known to call me “road map girl” because I like to know where I’m going…all the time. I like to not only know where I’m headed on a trip, but also where life will take us in general. I mean who wouldn’t want to know whether they were moving in the next year, or staying put? Who wouldn’t like to know if they were going to be at the same job this time next year? Life just doesn’t work that way though, does it? Abraham didn’t get a map, Joseph didn’t get a map, Jonah got a map and didn’t use it, Jesus’ mother didn’t get a map, and I sure didn’t get one either. I used to only want a mapped out experience, but as I am maturing (ahem) I’m finding I want adventure. I want new experiences. I’m finding that not having a map doesn’t necessarily mean I’m lost. It simply means I’m enjoying the moment I’m in. When I have a map, my focus is in the wrong place. 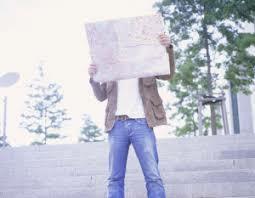 When I have a map, my eyes are downward, trying to figure out the next step. But, when my map is gone, my eyes are looking up. Psalm 121:1-2 says, “I will life up my eyes to the mountains; From whence shall my help come from? My help comes from the LORD, Who made heaven and earth.” This is where my eyes should be…on the Lord, not on some map. When I’m not too busy trying to figure out where I’m going, I realize where I am and it’s always wonderful. Always. Because God is here. Hebrews 13:5 says, “…be content with what you have, for He Himself has said, I will never leave you or forsake you.” This verse tells me to be content with where I am because God is here and that’s all I need. One step forward and two steps back? No problem. God is here. A marathon? No problem. God is here. Several mountains to climb? No problem. God is here. An adventure is eyes wide open to everything around me. A map leads to seeing one thing…the map. Did you notice the picture above? All around the guy holding the map is an adventure waiting to happen, but all he can see is his map. Sad, isn’t it? Eventually, he’s going to have to look up to see if he’s arrived, but he’s missing the journey. He’s missing the adventure. He’s missing the here and now. He’s missing everything… but his map! I want to stop being “road map girl”. I want the adventure that God has for me, the plan that only He can decipher, and the map only He can read. I want the adventure that He’s called me to and in order to see it I have to take my eyes off the map and turn my eyes to Him.